Although this wine is a bit pricier than what I’d normally deem a “Daily Drinker,” I find that I can’t help but come back to this wine again and again. Delicious, accessible, reliable, it’s the kind of wine that when I know I want it, I just make a bee-line for it. Price be darned. About the Wine: Hartley Ostini Hitching Post Wines are the product of creative geniuses Gray Hartley and Frank Ostini — the chef and owner of Hitching Post Restaurant in California’s Santa Barbara wine country. (Yes, the restaurant from Sideways). This particular wine comes from their pure pinot vineyards, Fiddlestix and Rio Verde Vineyards, in the Santa Rita Hills. 13.9% ABV. Flavor Profile: A little darker in hue than some pinots, the 2012 St. Rita’s Earth is a bouquet of bright fruits and floral notes on the nose upon the initial pour, setting you up for a bold red experience. However, once on the tongue, there’s an undertone of distinct minerality throughout the palate that calms down those bold berries and lightens the overall tone and quality of the wine. I would say the acidity is medium, and it’s the addition of this acidity that keeps the wine crisp and clean. The tannins are held back at a medium level: there’s certainly a lingering finish — some smokiness in the back of the palate, perhaps — but the wine is overall well-balanced. 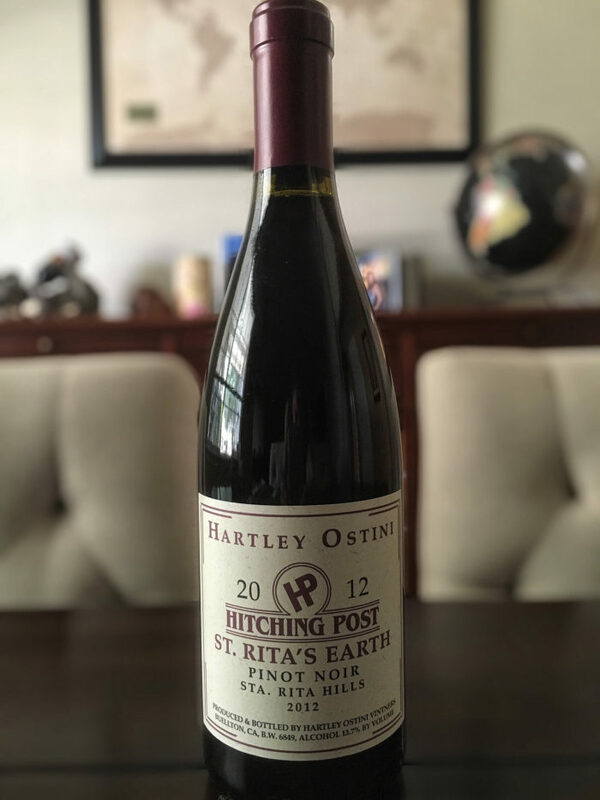 Food Pairing: Because Hartley-Ostini has captured that minerality and used acidity to open up this red wine, the 2012 St. Rita’s Earth could pair well with a variety of dishes. However, because I did get a sense of smokiness or woodsiness in that lingering aftertaste, I would highly recommend pairing this with a grilled red meat or cedar smoked salmon. Just be sure to have a lighter side, like a crisp salad, so as not to overpower the subtlety of this wine. More Info: Learn more about Hartly-Ostini wines and Hitching Post Restaurant and purchase wines directly from their website. I purchased this particular bottle at Safeway (Sale Price: $34.99). Stands back from the keyboard in amzeemant! Thanks!